8.1 "Mic in use by game"
Owners of Orcs Must Die! get "Classic Levels" DLC for free which containts levels from original games revamped to support CO-OP and new enemy types. Must be created by user. For more information see Extra configurations. 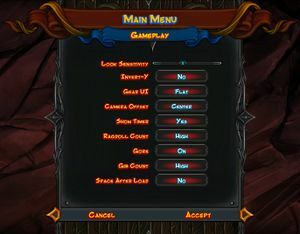 Gameplay settings including options effecting graphical quality. Vert-. Use Flawless Widescreen to fix FOV. Native option called Full Window. By default the game is capped at 84 FPS. Write ForceFPS=# and change # with desired FPS. Game seems to feature frame rate smoothing to keep frame rate steady. To get best result you should change value little higher than monitors refresh rate. If frame rate jumps too much mouse may behave unexpectedly. Shows 360 HUD if controller is connected even if keyboard and mouse is used. The game has to be run in using Steam Big Picture in order to type in a character name. 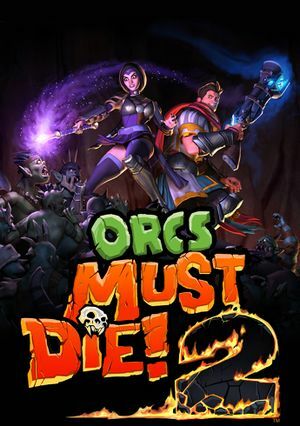 "Mic in use by game"
Orcs Must Die! 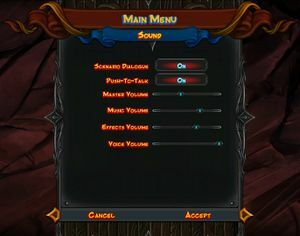 2 uses a native in-game voice chat system which disables the Steam voice chat and is also of lower quality than the Steam voice chat. This disables the voice system. Save your changes and put the file back into the data.zip archive. Once in-game you should notice an 'X' over the microphone icon under your character portrait, this means you are now able to use the Steam voice chat. 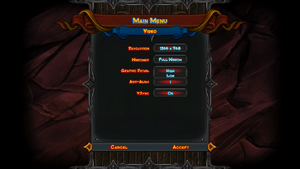 You can customize some elements of Orcs Must Die! 2 by creating a user.cfg file and adding notes into it. Create a text file called user.cfg. Use this option to turn off the AlienFX lighting effects on Alienware Computers. This may also help with game launch issues that some Alienware users are experiencing. Be sure the minus sign is included or this command won't work. Use this to completely disable in-game voice chat. Disabling the in-game voice chat will allow players to use the Steam voice chat instead, should they choose to. For players that want to play in 3D, this option will turn off the 2D reticule. 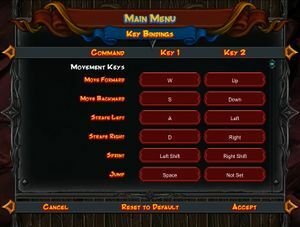 Instead of unbinding a key when you set it in the game menus to a key that's already in use, the game will swap with the key that was previously mapped. This will force the game to use a desired number of frames per second. Replace ## with the desired number. ↑ 2.0 2.1 File/folder structure within this directory reflects the path(s) listed for Windows and/or Steam game data (use Wine regedit to access Windows registry paths). Games with Steam Cloud support may store data in ~/.steam/steam/userdata/<user-id>/201790/ in addition to or instead of this directory. The app ID (201790) may differ in some cases. Treat backslashes as forward slashes. See the glossary page for details. This page was last edited on 26 February 2019, at 07:30.